There are many definitions of knowledge, but for me knowledge is the process of perceiving and reacting to our environment as a result of already established logical connections (biological and supplemental*). Knowledge in essence is wave based and comes from the mechanisms of perception – sound, sight, smell, touch and mental activity. With every new perception of knowledge, the work flow (function) and structure of our brain changes. This change occurs at both giving and receiving new information. Since we and our environment are intertwined, this method relies on presenting the subject information with the proper interconnection between its many components. Knowledge is an individual process. Shared knowledge implies unification. From this standpoint shared knowledge should form a unified meaning of studied subjects. Curiosity is a natural characteristic in human beings. Nowadays it’s being repressed by the present social-economic environment, which heavily imbues people with consumers behavior and puts intellectual development in the background. Yet, after all, curiosity is awakened by the asking of a QUESTION! The question is an outlet of curiosity. It’s this particular function of human beings that represents this method. The body and mind are connected. When asking a question, our organism, the brain in particular, instinctively changes and prepares to receive, analyze and memorize information. On biological and supplemental level many processes are activated and need to be kept active while delivering an ANSWER. Knowledge is shared(passed on) through the methods of curiosity. This process is divided into three stages, all combined into one cycle. What are the stages of one cycle? 1. Curiosity: The question itself. The question should be formed to create curiosity. 2. Answer: The answer must keep the curiosity at a high state for the longest period possible. Abstract presentation is mandatory. 3. Satisfaction: The state in which knowledge is memorized to last. Examples from the environment are mandatory. What are the phases of each state in the cycle? The question must contain basic information about the cognitive process, so that it incites curiosity. The time, required to understand the question must be relevant to the knowledge gained to that moment. The development of the cycle is in direct dependence of the development of the second phase. When an already memorized process is started, the third stage begins directly – Satisfaction. Confirmation of the known information is achieved. With a new process the stage of the answer follows. With abstract means the given question is answered. Minor cycles might be implemented in this stage. At this stage satisfaction must be gained. This is achieved through multiple examples from the world around us, in which the studied subject can be easily represented, resulting in an easy memorization. What are the main characteristic of a properly constructed cycle? With proper construction there is no need to check the gained knowledge through tests. The solid construction itself goes through all the mandatory cycles with the student. Zone A) Elastic deformations of iron and Curiosity – Question zone of the method. Zone B) Plastic deformation of iron and Knowledge gained zone of the method. As you can see the quantity of knowledge is stable, but the memorized knowledge grows – the knowledge is (plastic). 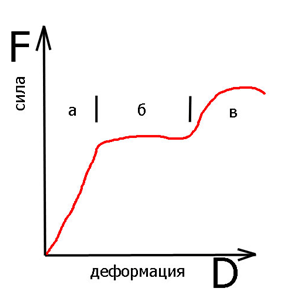 Zone C) Destruction of iron and Satisfaction zone of the method – in which perception is activated – new state. All this is a direct result of the interrelations in nature, whom we should not avoid. It has been proven that neurons connect themselves through synapses and that the axon-dendrite connection is plastic – the bonds aren’t necessarily permanent. When a question is asked, new bonds are created, and, I assume, new neurons as well! With a proper answer, the newly formed connections remain as permanent ones, and the newly born neurons start to develop. What is curious is that, when looking at abstract paintings, there aren’t any active brain areas in any of the participants. The rest of the paintings activate different areas. This shows that there isn’t a singular unified model with the abstract paintings and that presenting knowledge in an abstract way is an effective method. 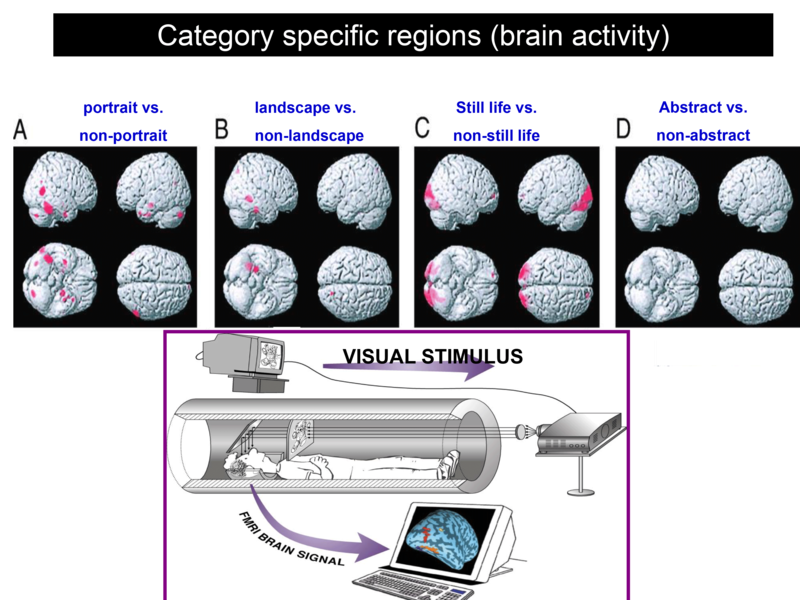 After an abstract answer is given, the example (proof) from our environment reconfigures and strengthens the synapse connections. The knowledge is now permanent. The part of abstractaction through life have diferent portion of knowledge. In childhood imagery prevails (O), while in the elderly dominates abstraction (A). In our age is back imagery. 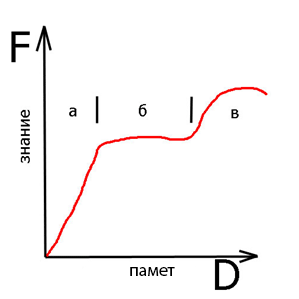 In all time there are curve of destiny as part of knowledge (D). That is very basic diagram, but in our life this curve is subject of individuality. To find this for students is teacher responsobility.